It’s been a number of years since I truly blogged on Garment of Praise. I spent the last week reflecting on all that has changed and I was reminded of my blog space. I’ve grown up a lot since writing on this site. Some ways in which I’ve grown, I can share with excitement, others I share with a broken heart. I feel older in so many different ways. Although I knew the truth all my life, my life was revolutionized by the truth and power of Jesus Christ a little under five years ago. The path that He has taken me on has been beyond my wildest dreams. People always told me that coming to know the Lord their lives changed. I don’t think I realized how much mine would. I can’t breathe without the Lord. I can’t think without the Lord. I can’t move without the Lord. God has taken me to a place of complete dependence on the Father because if there’s one thing I’ve learned since blogging regularly here it is that I can’t. I am marinating on two different posts right now. Hopefully they will be up soon. In the meantime, I would like to give a holla’ out to God and give him thanks today for the things that He has blessed me with. 1. For the Lord’s salvation, How He captured me and drew me in. 2.The redemption of my brother, His friendship and leadership in my life. 5. The support of my lovely friends and the fact that I will be able to see two dear friends from Eastern in a weeks span. 6. A roof over my head and food in the fridge. 7. For a church where I do not have to be afraid of persecution. 8. The healing of my heart. 9. For a greater purpose and faith. 10. Music, for like a channel, it draws me closer to the presence of God. Truly, I am so rich. Thank you God! I have multiple names (Laura Joy, LJ, Laura, Trouble). What people call me is often an indicator of how long they have known me or how close I am to them. God has multiple names too and before Jesus came, only certain people could refer to him by certain names. Before Jesus, no one could utter the name “Yaweh” unless they were pure by the basis of priestly duties and calling. Today, all of us can claim the name of God on our lives. I find it funny that often times in crisis I don’t want to be told about God. I don’t want to be told that “all things work together for those who love God and who are called according to His purpose.” I don’t want to hear that “God has a plan.” Selfishly, I just want God to be near. I just want to know that God has not hidden His face from me. I can call on God by His personal name. Because the veil was torn and because of the blood of Jesus, I can enter into the intimate place with the Spirit and I can call on Him as my Savior and redeemer. In this confusion and chaos, I look to Yaweh to be my guide. 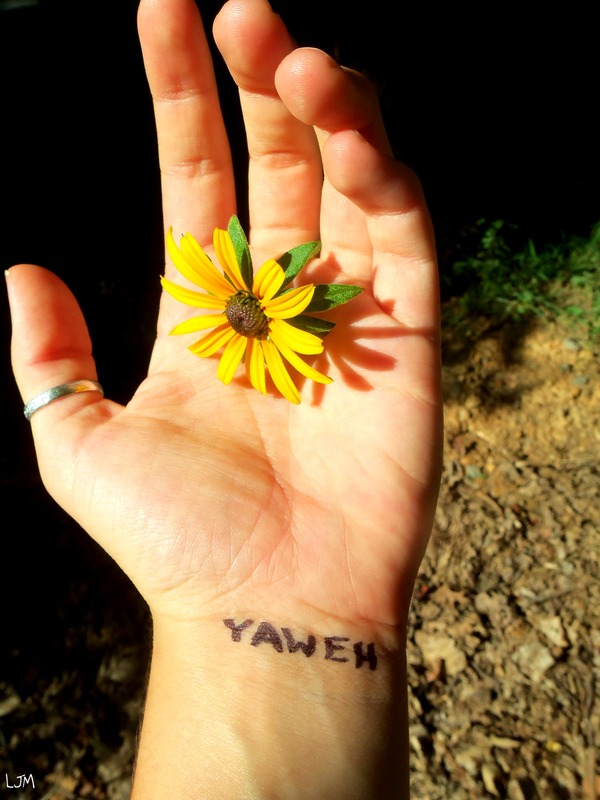 In this sorrow and gladness, I look to Yaweh to be my light. For the next season of life, I have a new blog. http://www.captivefree.wordpress.com. I will continue to pop back into garmentofpraise occasionally, but if you are looking for more updates about my life, I would encourage you to check out captivefree. Thank you, blog friends, for your continued love and support through many years and many ups and downs! You’re the best! You never really know the impact that your presence may have in someone elses lives. The longer I live the more I realize that we were created to touch others. From our words to our conduct, our presence can leave an impact setting the course of a person’s life. What are you saying to those around you? Are you speaking words of life or words of death? Are you showing them love or are you too busy to see the impact of your words? Especially if you are a follower of Christ, you set the course of lives. Don’t take that responsibility lightly. We’re all searching for something to fill the hole inside. We are looking for something to fill the need that we feel, something to comfort us, to ease the nagging or to the pain. Nothing on this earth will be enough. The further we run from Him trying to fill the voids inside of us, the worse that it gets, so the harder we feel we have to run away from Him when in reality, He has all we need. Let’s get back to the basics. Plain and simple. He is everything. We have nothing. He is wholeness and healing. We are by definition nothing short of brokenness. The only way to find a solution to the hurt inside is to take the first step and to come to him. I’ve been through an interesting period in my life these past couple of months. I can’t say I’ve ever been in a season quite like the one that I am in before. Some days to be frank I feel quite bi-polar. However, my source of consistency, my source of strength, my source of stability is (and always will be) my God. He is not a crutch, He is everything. Recently I’ve been thinking of the crazy love that my heavenly Father has for me and the people that I love. I know that I am guilty of viewing myself in the eyes of society rather then in His eyes. It only leads to disaster and heartache and I realized that it hurts Him when I do this. When my eyes are fixed on Him it is then that I see that I am not wasted space, but that He is crazy about me. It’s hard to digest. It’s hard to believe. It’s hard to let it sink in and accept it. Can I let you in on something? He is crazy about you too. I ended up writing a few poems/songs tonight that I feel I am to share with you. These I wrote for you from God. as my thoughts of you. my love is proved true. (saved me from my hell). can you see you’ve been renamed? Child of mine, let me rock you to sleep. to me, you are far more rare.